A man asserted to be a promoter of at least three fraud schemes, including TelexFree, has been hauled in front of TV cameras in Uganda. The report below is from NTV Uganda. The embarrassing appearance of the suspect may raise the stakes for promoters of online fraud schemes and create even more disastrous PR for cross-border MLM schemes. 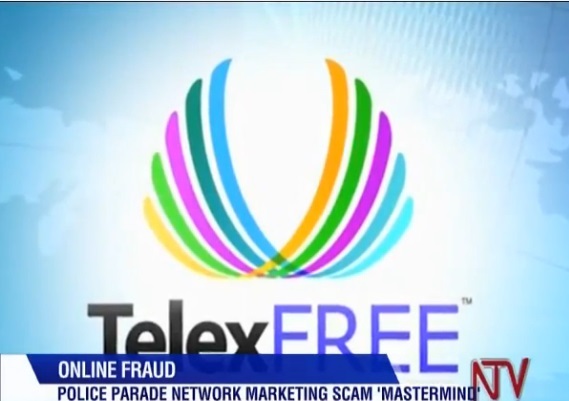 TelexFree has been accused in the United States of operating a $1.2 billion pyramid- and Ponzi scheme. In court filings, the SEC repeatedly has pointed to TelexFree promos that appeared on YouTube. Whether TelexFree, which now is batting civil and criminal fraud charges in the United States, would provide counsel for the alleged Ugandan affiliate was not immediately clear. Accused HYIP purveyors typically find themselves on their own, perhaps facing prosecution and the need to hire attorneys at their own expense. Some HYIP promoters proceed from scheme to scheme to scheme. At least eight alleged TelexFree managers/executives and promoters face civil charges in the United States. Two of those — James Merrill and Carlos Wanzeler — face criminal charges. The various probes are ongoing. The United States had labeled Wanzeler a fugitive. Would provide counsel for the alleged Ugandan affiliate was not immediately clear. How can Telexfree provide counsel if all assets of the company and individuals are frozen? How are even the Ponzie 8 able to retain their own lawyers if assets are frozen? Dorothy: How can Telexfree provide counsel if all assets of the company and individuals are frozen? Very good question, Dorothy. Here’s hoping it’s one the serial fraud-scheme promoters will ponder. There’s always plenty of glad-handing and backsplapping until the Feds move — and then it’s every man (or woman) for himself/herself. Dorothy: How are even the Ponzie 8 able to retain their own lawyers if assets are frozen? Pre-action set asides appear to have been used. We’ll know soon enough, I suppose, how aggressive the government intends to be in limiting the accused parties’ access to cash. We could see the paper equivalent of thermonuclear war or an approach that seeks to bridge the gap and ensures defendants aren’t denied adequate representation.